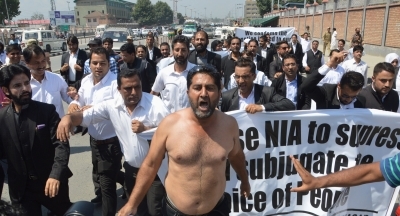 The NIA on Tuesday said it has arrested two stone- pelters in Kashmir in connection with an ongoing probe into terror funding to stoke unrest in the Valley. A National Investigation Agency (NIA) official identified the arrested accused as Javed Ahmad Bhat and Kamran Yusuf of Kulgam and Pulwama in Jammu and Kashmir respectively. On August 17, the counter-terror agency had arrested Zahoor Ahmed Watali, a prominent businessman of Kashmir. On July 24, the agency had arrested seven separatist leaders in connection with its probe into terror funding from Pakistan and militant groups based there.